An ideal instructional DVD for anyone wanting to play Irish music. Includes jigs, reels, hornpipes, plus picking techniques. 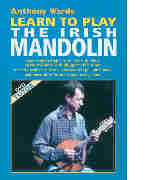 Anthony Warde shows you step by step how to play Irish traditional music on the mandolin. Each solo is then played live on the stage accompanied by some of Ireland's foremost musicians. Complete with live stage performances featuring... Vinnie Kilduff - whistle, Steve Cooney - guitar, Gerry O'Connor - fiddle, Peter Browne - button accordion. Steve Kaufman's amazing teaching method for mandolinists is now available on CD! His "Parking Lot Pickers" series, which has proved so popular with guitarists through the years, covers levels from beginners to advanced in a four-tiered system. Dan has arranged traditional Irish & Scottish dance tunes and airs. He has made sure to maintain the traditional flavor of these tunes, with ideas for Celtic ornamentation and clearly notated fingerings. This is one of the few books with mandolin settings of traditional Celtic music.